A good pair of Gothic Revival decorative door hinges. 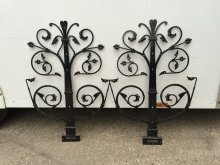 These have been bead blasted and powder coated for outside use. Height 47.5 incl. hinge, Width 32". Repro Coat Hook 1 - Reproduction Coat Hooks from an EATaylor Hallstand. Repro Coat Hook 2 - Reproduction Coat Hooks from an EATaylor Hallstand. Repro Coat Hook 3 - Reproduction Coat Hooks from a LandCo Hallstand. Repro Coat Hook 4 - Reproduction *hand* made copper hinge from a Liberty and Co desk.